In the ten years since leaving his native Bordeaux for the UK, Matthieu Destandau has done much to keep London’s Fitzrovia on the culinary map. He made his name a block or so south of his present incumbency on London’s Gt. Titchfield Street at CVO Firevault, which became an ultra-chic cocktail bar and party venue. But then he was headhunted by David Alberto chief executive of Avanta, the company which operates the nearby Media Village Business Centre, and the two men set about converting the somewhat drab, integral basement ‘canteen’, known as the Winchester Club, into the resplendent all-white Vanilla. Common to both Destandau’s’ enterprises has been the Sound Division Group. Yet the two venues could scarcely have required a more different approach, as Matthieu Destandau explained. Working with Carole Cobban from the architectural firm Amalgam, Matthieu Destandau himself conceived the backdrop in which all this would work. 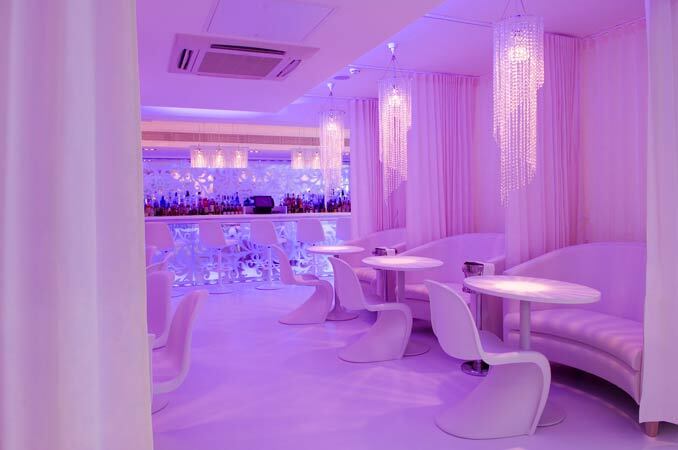 The result is a venue fabricated in crystal white — an idea, he says, which he borrowed from the Supper Club. 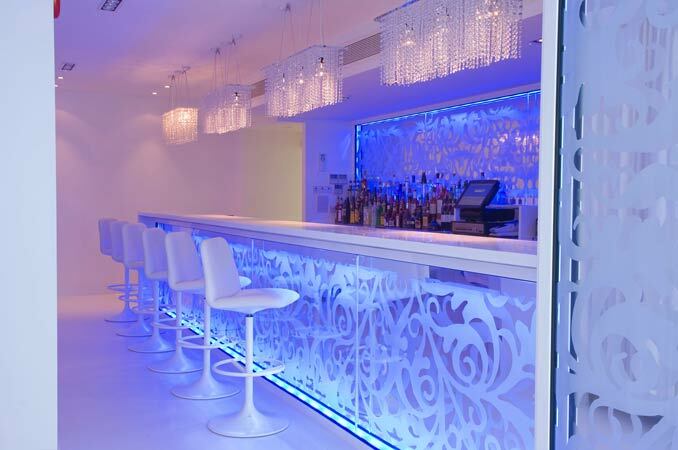 The Sound Division Group were given an exact brief, and to achieve the operator’s dream, they enlisted the help of Lighting Effects Distribution, who provided lengths of LED X-Chip that would wash, uplight and backlight the bar front and rear (including bottle washes), the kitchen front, the coves and even the toilets. The system was designed so that the gentle crossfade could be almost imperceptible over a period of time, or revved up later at night. “You can really feel the difference when the venue transforms from from pink to blue,” observes Matthieu. While technical project manager David (Woody) Homewood was programming a number of simple-to-operate lighting states into the AR12 controller, Sound Division’s Installation Manager Elliot Patterson together with Richard Astley (of JL Contracting) was designing the venue into four zones, controlled and remotely operated by a dbx ZonePRO 640. He brought in 8-Track Music Solutions to provide the music library of soft jazz, chill and R&B, delivered to both the formal restaurant and lounge bar areas via a pair of Apple Mac G4 computers, fitted with soundcards and the necessary software. The playlist is updated on a monthly basis. In the restaurant Sound Division have provided four corner mounted JBL Control 23’s driven by a Crown Xls 202 , while in the main bar and central lounge area the company has opted for a JBL Control 24CM flush ceiling solution. Four JBL Control 28’s provide a punchier solution in the front dance area, with a groundstacked Martin AQ12 sub hitting the lower frequencies. Crown XTi 1000 and Xls 402 (in bridged mode) drive this element of the system. The toilets have also been highly specified – with both LED and a ceiling-mounted JBL 24C Micro flush system (no pun intended). The dbx ZonePRO 640, four-zone loudspeaker management system, supplied with remote source select and volume control panels, presents the operator with a an elegant and cost-effective processing solution. Plug-in points have been provided for when the venue brings in a DJ — for private hire and corporate nights — something which Matthieu says is inevitable. What the Sound Division Group have left Matthieu Destandau with is a simple plug-and-play set up which required little operator training. “This business is all about relationships, and having worked with Sound Division and particularly David Graham at Firevault I was delighted to see they were able to interpret an entirely different brief at Vanilla, where we required ultimate flexibility. Given the current fashion and demand for LED lighting, Sound Division has quickly developed a real expertise for delivering client expectations in this department, he believes. Despite launching into the summer recess (and with Villandry as a neighbour) Vanilla is marketing itself heavily to the district’s media, fashion, music and production community (not to mention the BBC and various embassies on their doorstep). However, Vanilla still has a duty to the surrounding office block which opens at 9am, and will regularly be in full swing hosting early morning business meetings.